I have had feedback in August 2017 from Graham, who with two friends followed this walk succesfully. Please do get in touch to let me know how you got along, if you followed this, or other Cheshire 3 Peaks routes. 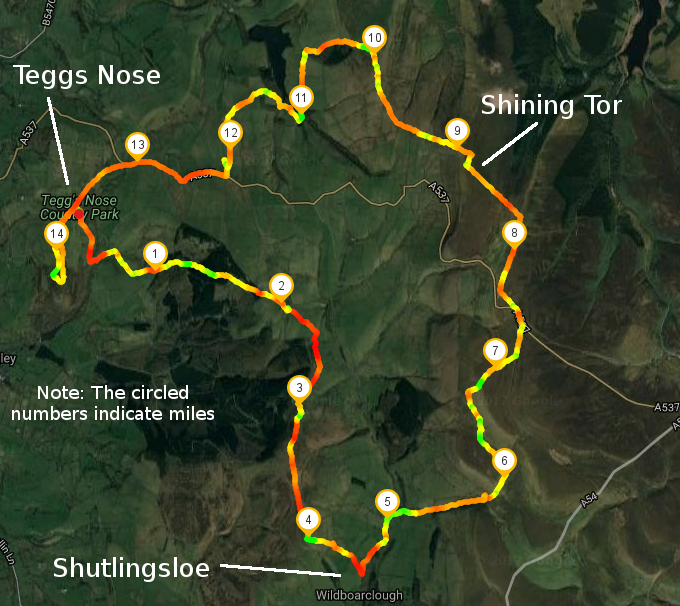 Download this as a PDF: cheshire_three_peaks.pdf (also in editable LibreOffice format). I have heard a few mentions (, ,  (pdf, also  which looks interesting) of a Three Peaks of Cheshire walk, but it's hard to find any write-ups on the internet. The best I found was the third of the three links above (by Graham Beech back in 2009), but I couldn't follow the description of how the walk ends. So I have taken that walk, come up with an ending for it which just about works, and written it up here, in case anybody is interested. Sadly that means missing out on White Nancy, but it also makes the walk about 5 miles shorter. Steps 1-8 below are following the Graham Beech walk; I have reworded some of it to reflect my observations in 2017. Waterproof clothing, walking boots, food and at least 2 litres of liquid are strongly recommended. The Cat & Fiddle pub is the only refreshment on the route (but as that has been closed for a few years now, I am not sure if/when it will be re-opened). Car Park charges, as at July 2017, are £2.50 for up to 10 hours at Teggs Nose. 1. Walk south-east from the car park (away from the road and the car park entrance) and down the steep "Saddler’s Way" track, also marked by a stone sign for "Langley and Forest Chapel". 2. When you reach the tarmac track, turn right along it. Keep with the tarmac track when the Gritstone Trail forks off to the right, and the tarmac track descends to the left. Then uphill, passing Lower Crooked Yard Farm (holiday cottages), after which the track turns 90 degrees to the right. 3. Continue along the track for 350 metres and, 20m after a signpost on your right, turn left through a stile to follow a footpath passing diagonally across a field towards Hardingland Farm. Pass the farm on your left and follow the tarmac road uphill. In 50m or so, just as the road bears left, take a footpath to the right and enter the forest. Proceed to a junction of paths where you bear right and continue on the main track, signposted to Forest Chapel. 4. Past a stone barn you meet a path crossing your path, from the left to the right. Ignore this, and find the stile into the forest straight ahead, signposted "Forest Chapel". The track goes steeply uphill through the forest and then down to Forest Chapel. You meet the road on a corner; follow the road straight ahead (left?) and upwards, for a quarter of a mile to a T-junction and turn right. After another quarter of a mile, you come to a T Junction. Crossing the road and going through a gate, follow the path straight ahead signed to Shutlingsloe. 5. After 350 metres, a path forks off to the left. Follow the signed concessionary path, initially with forest on your right, to the top of Shutlingsloe. At 506m (1670ft) this is our first major peak. 6. Continue over the top in roughly the same direction (east, follow arrow). Head downhill and turn right at a tarmac track. After a hundred metres or so, a sharp hairpin left takes you onto a rough track alongside woods on your right. Two gates and a stile lead to the road through Wildboarclough. Cross the bridge almost opposite, head towards a large farm (main building on left) and walk through the farmyard. Leave the farm by turning right on a tarmac lane, then cross the road to a gated track leading to Cumberland Clough. 7. Once in the clough, cross the footbridge and walk uphill with the stream on your right. Keep to the path nearest to the stream – do not take any side-turnings. At the top of the clough, a path crosses your path by the waterfall. Turn left (‘Cat & Fiddle’ sign). Climb steeply uphill to a Public Footpath sign at a T-junction where you turn left again and walk across open moorland, to the Cat & Fiddle pub. Important: I did not see a Cat & Fiddle sign. There's an extreme left, then a left hand path which is actually a stream, even though it's labelled as a public footpath. I think I was meant to have gone straight ahead. Cross the busy road and turn left yet again. Go downhill and turn right at a Public Footpath sign. Continue on a track, ignoring the left fork to the Peak View café. Pass an ‘Errwood’ footpath sign and then, after a further 200m, turn left at the stile, going downhill briefly, then up to the summit of Shining Tor. Note: I didn't make a note of what the sign said, pretty sure it was pointing you to Shining Tor. 8. Climb to Shining Tor, the highest point in Cheshire – 559m, 1845ft; you can visit the trig point by way of a concessionary stile. This is where I deviate from Graham's walk. 9. Turn right when you get to the top of Shining Tor, follow the path towards Cats Tor for a few hundred metres. Take the first public footpath to the left, signed Lamaload Reservoir. Follow the path down into the valley, up the other side, and follow the wall/fence along the ridge, until you get to the end of the wall (almost parallel with Cats Tor, to your right). Turn left, down into the valley towards the reservoir, over two stiles. When you get to the forest, keep the forest fence on your left hand side and head down to the reservoir. 10. Through the gate, turn left onto the road, keeping the reservoir on your right. Follow the road along, then down, and after it curves right and upwards, take the footpath along the reservoir circular walk, with the forest on your right. 11. When you've passed by the bottom of the reservoir, find a footpath up to the left, labelled "Walker Barn" (and away from Rainow). Although it is a public path, there isn't a clearly marked footpath through this field, but go up to the top of the field, and find the footpath sign on the wall at the far end. Follow the sign to Walker Barn, through two fields, until you get out onto the road by the cattle grid, with the Cat & Fiddle Road about 20 metres to your left. Go to the Cat & Fiddle Road, turn right along it, and follow it down, around some tight bends. At the bottom, just past the millstone sign (and the average speed cameras), take the left signed 0.5 miles to Teggs Nose. 12. Once back at Teggs Nose, take the wide gravel path alongside the road, and through two gates. To get directly to the summit, go straight ahead (not left up the steep steps), curve left with the path, and right through a gate, following the path uphill through a field. The summit is marked by a circular stone wall, which you can stand in the middle of. Continue back down, and follow the path left, to return to the car park via the wide gravel path.